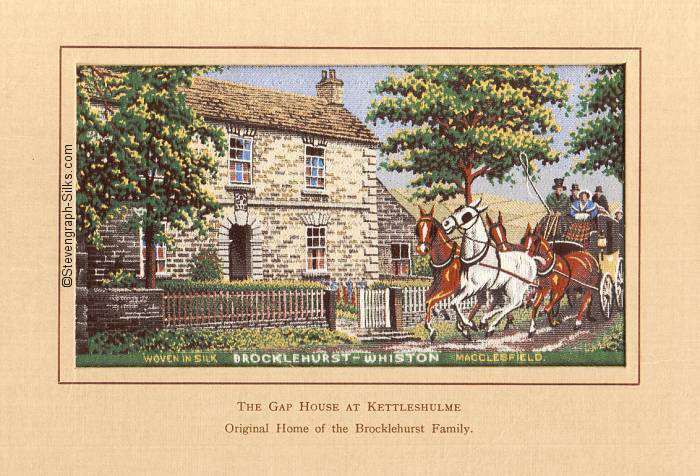 For 1952 the subject chosen was THE GAP HOUSE at Kettleshulme, which had been in the Brocklehurst family from at least 1662, and stood on a hillside overlooking the area where Whaley Bridge reservoir now lies. A plaque set in the wall of the oldest part of the building shows G.B.1662 - clearly George Brocklehurst, the grandfather of John, who lived in the Lower House at Hurdsfield from 1747. Lewis Cowen records this silk as being made in 1952, and this date is also given on the "Complete Woven Silk Picture Collection", as printed on the reverse of The King's School. I have however seen a copy of The Gap House on which is printed on the front cover "Christmas 1951"